Winner, Best of Show: Joseph Ambalu, Amba Gem Corp. - Platinum and 18K yellow gold ring featuring a 7.16 ct. untreated Russian Emerald accented with Diamonds. Best Use of Platinum Crown: John Haynes, Schmitt Jewelers - Platinum "Solar Blossom" ring featuring a 14.73 ct. orange Zircon accented with tsavorite Garnets (.67 ctw.) and Diamonds (.65 ctw.). Best Use of Color: Ricardo Basta, E. Eichberg, Inc. - 18K yellow gold "Phoenix Rising" necklace featuring Mandarin Garnets (28.04 ctw.) accented with Paraiba Tourmalines (1.55 ctw. ), Sapphires (4.68 ctw. ), Rubies (3.17 ctw. ), fire Opals (1.35 ctw. ), tsavorite Garnets (.02 ctw.) and a .77 ct. Turquoise. 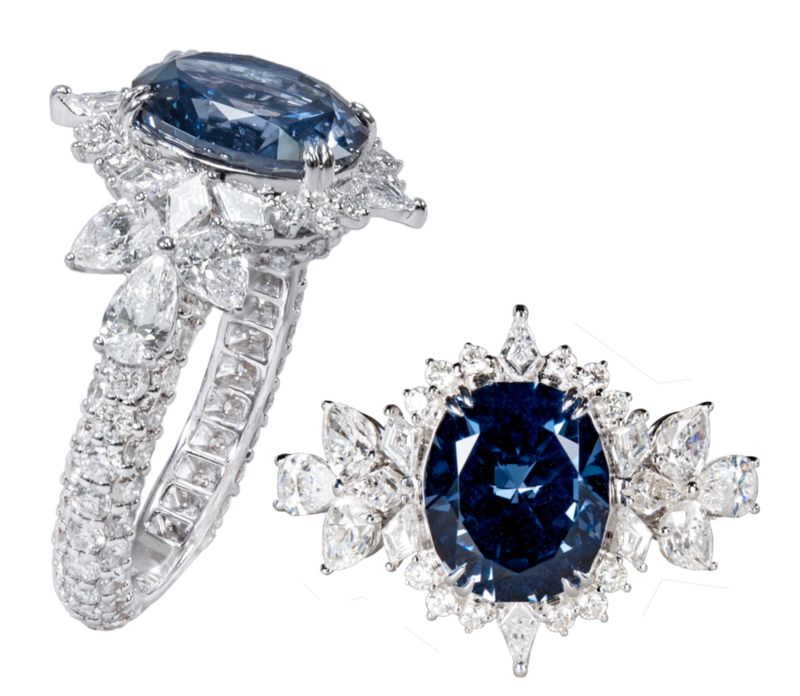 Editors' Choice Award: Caroline Chartouni - 18K white gold ring featuring 4.50-ct Blue Spinel accented with 2.98 carats of Diamonds. Classical - 1st Place: Niveet Nagpal, Omi Prive - Platinum ring featuring a 10.23 ct. cuprian Tourmaline accented with Diamonds (2.57 ctw. 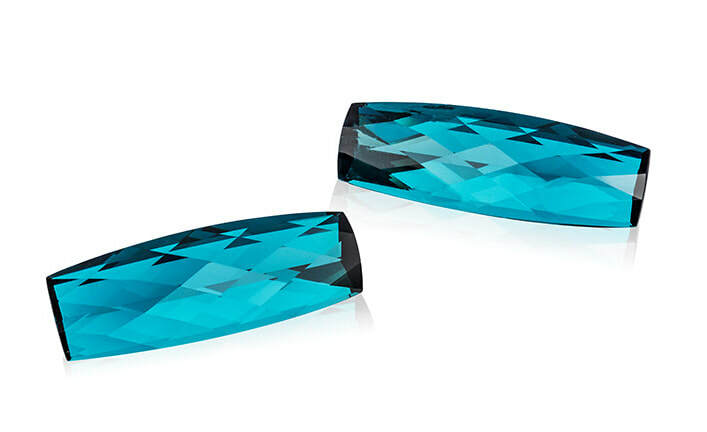 ), Paraiba Tourmalines (1.54 ctw.) and a .01 ct.Alexandrite. Business/Day Wear - 1st Place: Erica Courtney, Erica Courtney, Inc. - 18K yellow gold "Emerald City" necklace featuring a 105.99 ct. pear-shaped Emerald accented with Diamonds (4.42 ctw.). 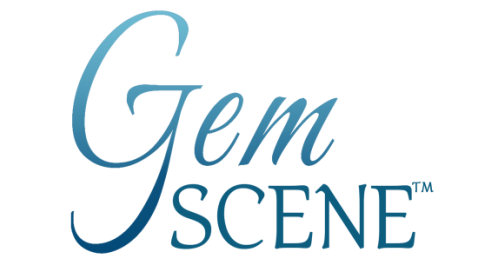 The American Gem Trade Association has announced the winners of the 2018 AGTA Spectrum Awards. The competition was held in New York on August 4 and 5, 2018 and is regarded as one of the world's preeminent colored gemstone and cultured pearl design competitions. The distinguished panel of judges were: Darryl Alexander, Alexander's Jewelers; Randy Coffin, Coffin & Trout Jewellers, Inc.; Andre Hahn, Vielle Jewelers, LLC; Peiter Hye, Pieter Andries Jewelers; and Dallas Prince, Dallas Prince & Company. Bridal Wear - 1st Place: Zoltan David, Zoltan David - 22K and 18K rose gold necklace featuring a 46.12 ct. Opal accented with a 3.60 ct. round Opal and blue Sapphires (2.40 ctw.). Fashion Forward: Patrick King, Jewelsmith, Inc. - 14K white and rose gold pendant featuring a 13.31 ct. Sapphire accented with Sapphires (.98 ctw.) and Diamonds (2.91 ctw.). Men's Wear - 1st Place: Zoltan David, Zoltan David - Steel and 24K gold ring featuring a 25.53 ct. blue Zircon. Evening Wear - 1st Place: Gross & Currens, David Gross Group - Platinum ring featuring a 20.26 ct. cushion-cut unheated yellow Sapphire accented with Diamonds (3.60 ctw.). Best Use of Platinum and Color: Deirdre Featherstone, Featherstone Design - Platinum "Wonder Woman" cuff featuring Aquamarines (4.54 ctw. ), Tanzanites (2.44 ctw. ), blue Zircons (1.60 ctw. ), lavender Spinels (.46 ctw. ), Tourmalines (.68 ctw.) and star-set Diamonds (2.64 ctw.). Best Use of Pearls: Avi Raz, A & Z Pearls, Inc. - Necklace featuring 15-18mm multicolored natural baroque freshwater Pearls accented with 14K rose, yellow and rhodium gold beads. All Other Faceted - 1st Place: Mikola Kukharuk, Nomad's - 80.25 ct. oval tsavorite Garnet. Phenomenal - 1st Place; Joel Price, Joel Price - 34.63 ct. oval harlequin Opal. Innovative Faceting - 1st Place: Mark Gronlund, Mark Gronlund - 96.30 ct. round spiral brilliant-cut blue Topaz. 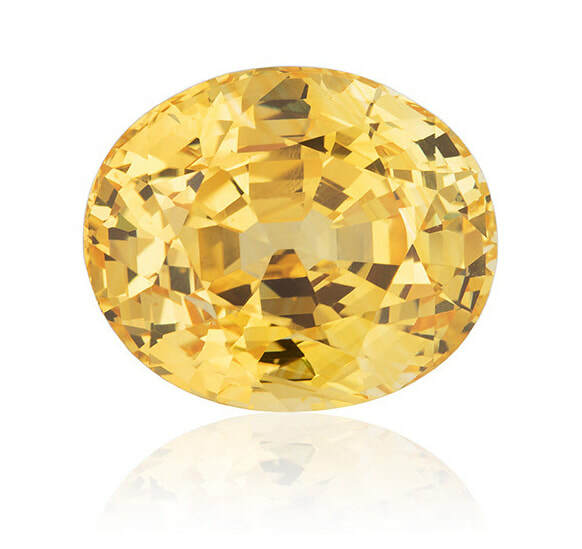 Classic Gemstone - 1st Place: Kenneth Blount, 100% Natural, Ltd. - 91.36 unheated yellow Ceylon Sapphire. Objects of Art - 1st Place: Nicolai Medvedev, Impressions in Stone - Intarsia box with vaulted lid. 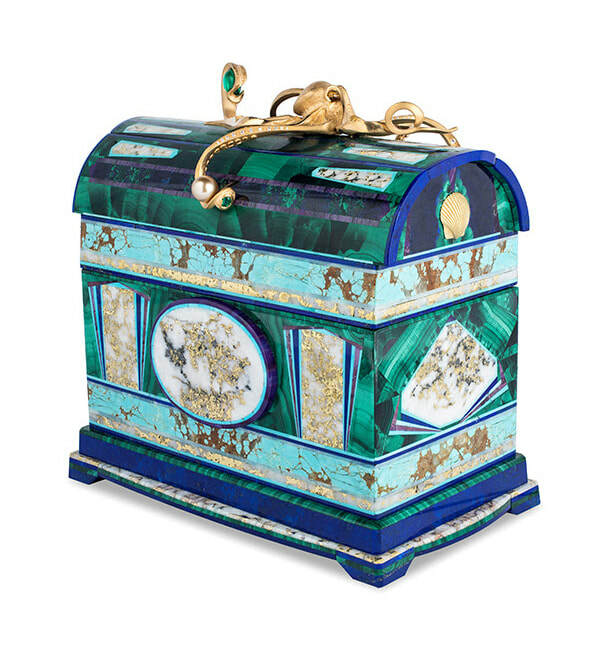 Materials include: Malachite, Turquoise, Malachite/Azurite, Sugelite, Lapis Lazuli, Opal, cultured Pearl, Emeralds and Diamonds. Pairs & Suites - 1st Place: Stephen M. Avery, Stephen M. Avery - Pair of indicolite Tourmalines (41.45 ctw.). Carving - 1st Place: Dalan Hargrave, GemStarz Jewelry - "Frog Prince" featuring Sunstone (160 ctw.) accented with Sapphires, Diamonds, Opals, black Jade, green Jade, Chalcedony, Calcite and 14K yellow gold.